PRP therapy has gained some national media attention because of its use in high-profile, professional athletes. These include Troy Polamalu, strong safety for the Pittsburgh Steelers; Hines Ward, wide receiver for the Pittsburgh Steelers; and former defensive lineman for the UVA Cavaliers Chris Canty who is now a defensive lineman for the New York Giants. PRP treatments involve drawing a small tube of blood from a patient’s arm. The blood is spun in a centrifuge to concentrate the platelets, which are injected into the injured area. Platelets contain growth factors which are important for tissue healing. 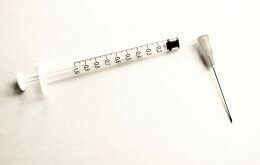 The injection causes the body to respond with an inflammatory process that will ultimately aid in repairing tissue. “Since the injection is derived from the patient’s own blood, there is no chance of adverse reaction to drugs or chemicals. PRP is very safe,” Diduch explains. Diduch says that PRP therapy could be helpful for chronic overuse syndromes, such as Achilles tendonitis, knee tendonitis (quad or patella tendon), elbow tendonitis (golfer’s or tennis elbow), plantar fasciitis of the foot, or rotator cuff tendonitis. It could also be beneficial for acute injuries, like MCL sprains, or hamstring/quadriceps/groin muscle strains. To schedule an appointment to discuss whether PRP therapy is right for you, please call the UVA Sports Medicine Clinic at 434-243-0274.